Is there a way to fix TenFourFox so I can receive all my Gmail Correspondence. (See the attachments) On Omniweb, I can find all my correspondence, but on TenFourFox many are missing. Omniweb is not using the same interface as TenFourFox. TenFourFox is using the full Gmail interface. Omniweb is using the basic HTML view. 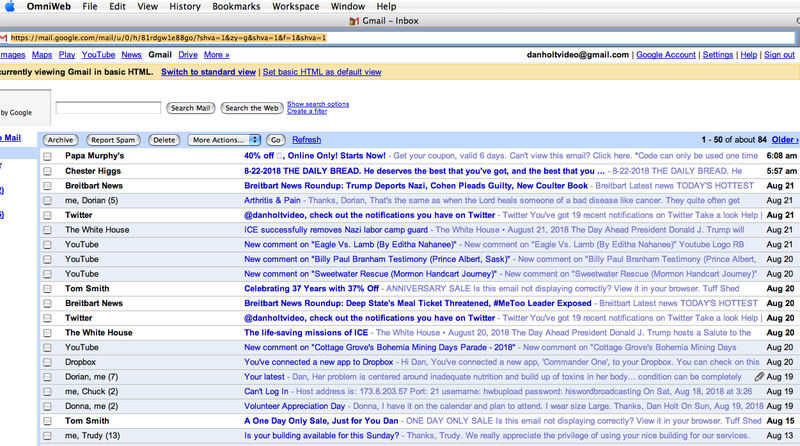 The basic HTML view is more compact, so more fits on the screen and has other differences about how mail is displayed. Also, check some of your other folders (such as the Social and Promotions tabs) for messages that may not be visible in your regular inbox.